King Shaka International Airport, the primary airport serving Durban, is your gateway to the Golden Mile and home of the bunny chow. 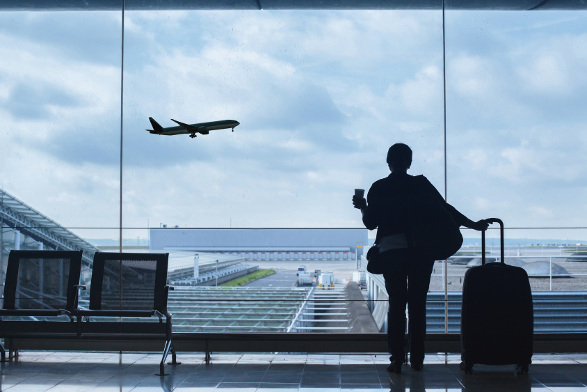 Since its much-anticipated opening in 2010, King Shaka International Airport has gathered a number of prestigious awards and become one of the busiest airports in South Africa. King Shaka International Airport (IATA code: DUR) is a key airport for domestic arrivals and departures and the hub airport of SA Express. Flights to King Shaka International Airport are provided by international airlines such as Emirates, British Airways and Qatar Airways. Domestic airlines that land here include Kulula, FlySafair and Mango. DUR is a 30-minute drive from Durban Central. Book your cheap flights to and from King Shaka International Airport online! King Shaka International Airport is a hub for domestic and international travel in KwaZulu-Natal and the third busiest airport in South Africa. Also known as La Mercy Airport, the airport opened its doors in May 2010, a month before the FIFA World Cup kicked off. King Shaka International Airport replaced the existing Durban International Airport. With state of the art facilities and flights to a number of destinations throughout South Africa and the rest of the world, King Shaka International Airport is considered one of the best airports in Africa. Popular flight routes to King Shaka International Airport are from Johannesburg to Durban, Cape Town to Durban, Lanseria to Durban, Nelspruit to Durban and East London to Durban. Whether you need to entertain yourself during a long layover, buy gifts for friends and family, or simply want to indulge in a little bit of retail therapy, King Shaka International Airport is home to a number of shops and services. Services include: banks and foreign exchange, post office, pharmacy, and cellular shops. Shops at King Shaka International Airport range from clothing retailers and jewellers to department stores and restaurants. Duty-free shopping is available airside in departures. Please be aware of baggage restrictions and duty-free allowances at your destination. The King Shaka International Airport lounges in the departures terminal area are equipped with comfortable seating areas, work areas with complimentary Wi-Fi, complimentary food and drinks, television and newspapers, monitors with flight statuses, and shower facilities. The Bidvest Premier Premium Lounge and Umphafa Premium Lounge are open to all passengers who are willing to pay the entrance fee, while the British Airways Slow Lounge and South African Airways Baobab Premium Lounge are open to certain passengers. King Shaka International Airport also offers the following facilities: medical, porter services, disabled facilities, a chapel, and a prayer room for Muslim passengers. This 3-star guest house is a 15-minute drive from King Shaka International Airport. Amenities include a swimming pool, housekeeping, full breakfast, air conditioning, garden, library, and airport shuttle service. Complimentary Wi-Fi and parking are available. This 4-star bed and breakfast, situated right on the beach, is a quick 15-minute drive from King Shaka International Airport. Amenities include a swimming pool and parking. Complimentary Wi-Fi in the lobby is included. This 4-star hotel and spa is a 15-minute drive from King Shaka International Airport. The hotel is fully equipped with a casino, restaurants, bars, spa, swimming pool, nightclub, and garden. Some of the amenities include childcare services, 24-hour front desk, housekeeping and laundry service. Free breakfast and Wi-Fi are available. Most exchange bureaus allow you to purchase foreign currency 60 days before departing South Africa. Parking options available at King Shaka International Airport include arrivals pick up facility, shaded parking, premium multi-storey parking close to the terminal building, and long stay carports. Cash and credit card payments are accepted. King Shaka International Airport is located in La Mercy, which is approximately 35 km north of the Durban city centre. A number of transport options are available at the airport which will get you to your destination. Some of these include: Shuttle bus, metered taxis, car hire, and Uber.